The Blazer has an air-cooled Corvair engine mounted up front. This sturdy 80-hp mill will not freeze up or boil over and has proved itself extremely resistant to dust, sand and foreign matter. When the going gets rugged you shift to four-wheel drive; when it gets ruggeder you switch the three-speed transmission into low range. ONE of the sights of Cheyenne, Wyo. is this conglomeration of car, motorbike and machinery parts. The engine is from a hay baler. The hard tops, one for summer and one for winter, are Dodge trunk lids. Cycle tires are on all three wheelsâ€”the front two of which are Chryslers. 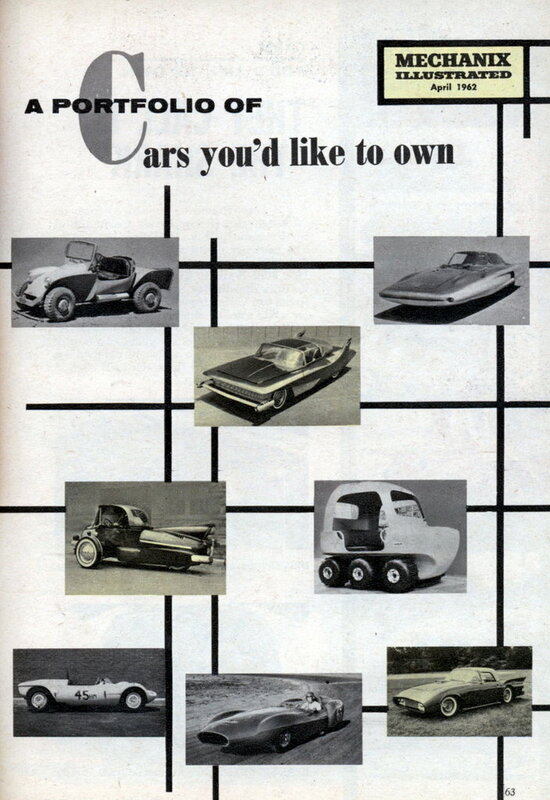 Several other makes go into it as well. Builder Mel Gould has driven it 12,000 trouble-free miles. IN the past Ed Alsbury, a safety engineer and hobby racer of Class H cars from Kirkwood, Mo., has used the popular little Crosley engine in his cars. Class H mills are limited to 46 cubic inches. His latest homebuilt, which will hit about 95 mph wide open, has a rear-mounted, four-cylinder, 50-hp Mercury outboard motor. He chose this power package to keep the weight down; the finished car weighs 685 lbs. with gas and oil. The JABRO body, a glass fiber job by James Broadwell, allows the engine to be mounted fore or aft. 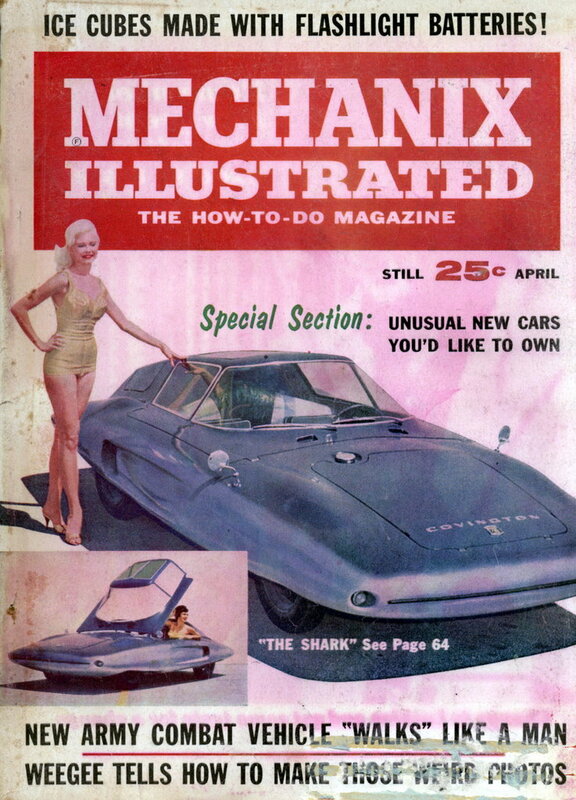 (The first JABRO car appeared on Mi’s cover in May 1958.) For ease of maintenance the body may be completely removed by removing two bolts up front and two at the rear. HERE is the wild beauty you find only in car bodies that are designed to stabilize and to cut drag at very high speedsâ€”such as 200 mph. If you have a spare $13,000 in your hankie drawer you can flirt with speed like that in your new Stiletto racing sports car by Bocar Manufacturing, Denver, makers of fastish cars. The Stilleto’s injected Corvette engine twists out 500 hp at 8500 rpm. While it hits 200 only now and then it can hold 130 mph for a quarter-mile with a full tank. It’s 14 feet, nine inches long, weighs 1,740 dry. Brakes are 11-inch Bendix aluminum jobs. Torsion bars fore and aft. For winning races! CAN THIS BE A THUNDERBIRD? THIS totally customized 1956 Thun-derbird has won more than 182 trophies in car shows throughout the United States and Puerto Rico. The rebuilding job was done by owner Don Von Dwingelo of Paramus, N. J. and Tony Bruskivage of Hawthorne, N. J. The body glows with 16 coats of red lacquer; the hardtop is cream speckled with gold. Dual headlamps from a 1960 Chevy beam from oval-hooded grille. The richly upholstered interior features black Naugahyde seats and a black, piled rug flecked with gold dust. The dash sports Stewart & Warner gauges and a white radiotelephone. Power for this rocket derives from a 1958, 461-cubic-inch Olds engine that answers to a competition stick shift.